Height: 36” Blossom: 6” Dor. Dip. Pauline Frances is one of the largest and prettiest of our pinks. 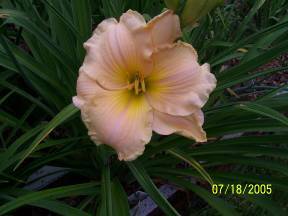 With full form and nice recurve, she is a creamsicle pink with a pretty yellow throat and at times a light shade of green may show in her sepals. Pauline comes from our ten year pursuit for pure white. Pauline Frances is one of nineteen hundred seedlings.